This 17th Century drawing was one of the longer jobs we’ve had, and we knew this would be the case as the amount of work would be extensive, and we would also need to make some important design decisions. Areas of loss in the paper and smaller pinhole-sized holes were prevalent across the artwork. On the reverse some asphaltum was adhered, which is a type of tar. Stains had developed and acid contaminates had migrated into the paper. Chemical baths lifted the stains and neutralized the acid contaminates. Another chemical was used to soften the asphaltum which was then carefully scraped with a scalpel, and then another chemical helped to treat the underlying stains. New paper pulp to fill the lost areas was made and incorporated with water that self-adhered to the rice paper quality of the original. The new frame we made is a custom Sienese Italian with granito and raised gesso-corners with a feather motif and matching spandrel. We noticed in the cap that there’s a feather, and we brought that decoration into the corners. The granito can be seen around the feathers as the small dots. Restoration started back in March and we are particularly satisfied with the culmination of what was months of slow progress. As the various aspects matured the anticipation kind of teased us with how they would eventually look together. 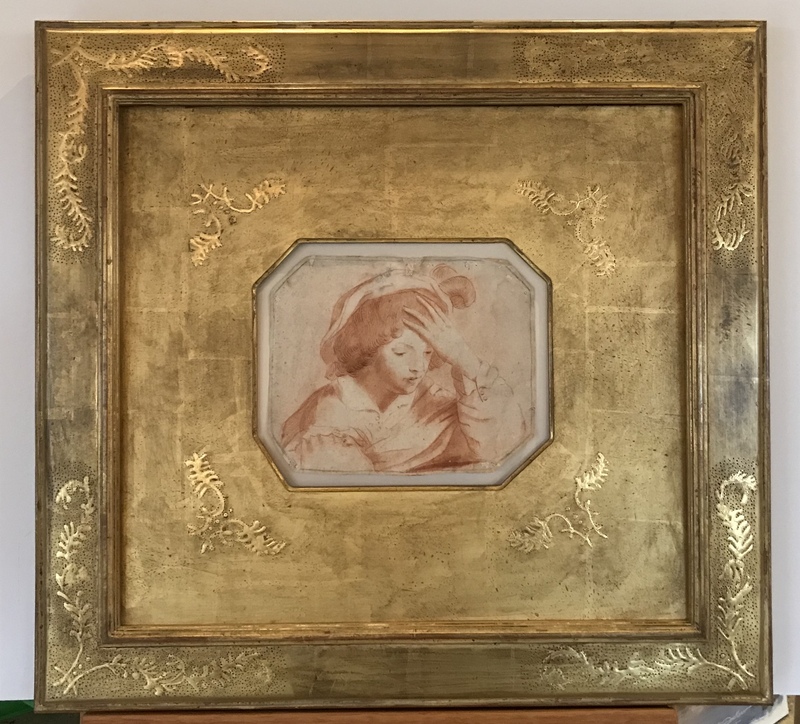 But when they finally did come together we were thrilled with how the frame and spandrel appear to be the same period as the drawing, and how there’s a shared elegant quality that is still inviting in an introspective, personal sort of way.